Opening Hours: Daily 10am-5pm (Sun Closed). Decorated by Little Book Transfers. A fabby singsong round the BTFL piano ! 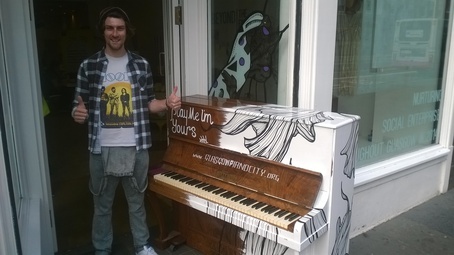 A wee taste of life on Argyle Street as the BTFL piano catches a great player on his way to Glasgow Green. Paul Mcdonald with ' Kelvin ' outside the Beyond the Finish Line office after a cheeky bit of Chalk Pen signage.